When the suave Agent 007 (Pierce Brosnan) is assigned to protect a beautiful oil heiress (Sophie Marceau), he is catapulted into a passionate, adrenaline-charged adventure that pits him against one of his most deadly adversaries: Renard (Robert Carlyle), a ruthless anarchist whose total imperviousness to pain makes him a virtually unstoppable enemy. The unrelenting suspense, breathtaking action and sly wit never let up in this explosively entertaining thriller. Well thought out plot, an endearing Bond, a superb villain in Robert Carlyle, and an outrageous action packed movie funfest. The characters are interesting across the board, Coltrane is back as Zukovsky, Judi Dench shines as always, and Cleese is introduced following the sad loss of Desmond Llewelyn who has a nice final farewell scene as Q. Denise Richards is ridiculous in the role of a nuclear physicist, albeit fantastic eye candy in shorts and breast hugging tee shirts. Not the best of the franchise, but a lot that I enjoyed and thus I give a good mark for this film. Pierce Brosnan plunges into action as James Bond in this adrenaline-pumping thrill-ride, co-starring Oscar® winner* Halle Berry. Bristling with excitement, bursting with explosive special effects and surging with high-octane chases, Die Another Day is a pulse-pounding adventure with "super cool quality from start to finish" (NEWS OF THE WORLD). "Bond is back and it's even better than ever" (THE SUN). An amazing start, complete with spies surfing in to North Korea, an amazing action sequence with hovercrafts, and then a memorable set where Bond is held captive and given up by MI6. However the film slowly drifted away, somewhere it just didn't work. The choice of Berry was poor, as she tried desperately to steal every scene and spewed cringeworthy lines, and the speed she dropped her pants was amazing even by 007 standards - a couple of corny ornithology chatup lines and bish bosh she's bedded. The invisible car was ridiculous, possibly only overtaken by the VR shots with Moneypenny. On the plus side I loved the fencing scene, the attractive supporting cast, and the Ice Palace was an impressive backdrop. CASINO ROYALE introduces JAMES BOND before he holds his license to kill. But Bond is no less dangerous, and with two professional assassinations in quick succession, he is elevated to "00" status.Bond's first 007 mission takes him to Madagascar, where he is to spy on a terrorist, MOLLAKA (Sebastien Foucan). Not everything goes to plan and Bond decides to investigate, independently of MI6, in order to track down the rest of the terrorist cell. Following a lead to the Bahamas, he encounters DIMITRIOS (Simon Abkarian) and his girlfriend, SOLANGE (Caterina Murino). He learns that Dimitrios is involved with LE CHIFFRE (Mads Mikkelsen), banker to the world's terrorist organizations.Secret Service intelligence reveals that Le Chiffre is planning to raise money in a high-stakes poker game in Montenegro at Le Casino Royale. MI6 assigns 007 to play against him, knowing that if Le Chiffre loses, it will destroy his organization. 'M' (Judi Dench) places Bond under the watchful eye of the beguiling VESPER LYND (Eva Green). At first skeptical of what value Vesper can provide, Bond's interest in her deepens as they brave danger together and even torture at the hands of Le Chiffre.In Montenegro, Bond allies himself with MATHIS (Giancarlo Giannini), MI6's local field agent, and FELIX LEITER (Jeffrey Wright), who is representing the interests of the CIA. The marathon game proceeds with dirty tricks and violence, raising the stakes beyond blood money and reaching a terrifying climax. Brushed off Casino Royale for a 3rd viewing (1st in cinema, 2nd on dvd) in preparation of seeing Quantum of Solace, this time watching on BluRay. I am bias being a true Bond fan, and the high definition viewing with pure sound was awesome. I am in favour of the new 007, from the books I always thought he was a cold character and more ruthless than typically portrayed, and this is perhaps less 'comic-book' than previous adventures. Good to see the scene with the cut-out wicker chair is in this version of the film mirroring the book. The only minor criticisms I have with the new format were too few gadgets, and lack of a memorable theme song. A good start to a new Bond. I felt it would be a trilogy because this was the first continuing sequel to a Bond film, yet it is still unresolved. Both villains feel like soldiers; we haven't had the Big Bad yet! 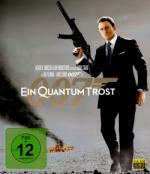 Casino Royale was about getting control of the economy, while Quantum was about them trying to control energy (IIRC). A good part three might be the head of Quantum breaking cover to attack MI6 head on. I didn't find the main story unresolved (Bond's bit) but you are right, the villain side feels a little open, as the guys we saw so far are clearly only mid-level henchmen rather than the leader of the pack. BTW, Quantum was trying to control water in this film; although in some scenes it is shown that their actual range of business is much broader. I read somewhere recently that they are planning to bring Blofeld back for the next movie. No idea if he is supposed to be involved with the Quantum group from this one or if they are also bringing back SPECTRE. I think if they bring back Blofeld, then they should bring back Miss Moneypenny and Q. It's just...odd for them not to be around. With the next film given us "the real Bond" I would imagine we should also get those well-known characters. There was a rumour that Michael Sheen was lined up for Blofeld, but Empire are claiming it only started because they said he could be good (the writer for the new Bond also did a couple of Sheen's other films). Well, he is listed at IMDb as cast memeber for "Bond 23". But he is shown as "Blofeld (rumored)", so that could meamn that the role is rumored based on Empire or his entire attachment to the film is rumored. I enjoyed the second outing more than Casino Royale. Funny though, as I remember it being the other way around when I first saw them. I didn't like the villain though. Hey, you managed to say even less about this movie than I did. I did recently watch Goldeneye for the first time in years. I like it much better than the ones with Dalton. Bond was charming and refined again, though he would do what was needed to get the job done. I loved that M was a woman. Moneypenny and Bond have chemistry together again even though they aren't in many scenes together. The plot works well and provides a decent motivation for the villain. The stunts and action scenes are very well done. The women are interesting. I think the casting was done well. Overall I really like the movie. Certain things are a bit silly, but the movie is entertaining. I still have to watch the extras on my DVD. I think I am the only one not done. Sorry about that. I still have..umm...5 more to watch - counting Quantum of Solace. I really enjoyed this movie more than the Dalton Bond movies. I think Pierce Brosnan handles the part well. The plot is entertaining and interesting even though a few things are a bit far fetched. The villains work well for the plot. There is a decent amount of action throughout the movie and some violence that isn’t extreme. The rest of the cast works well and I love the idea of M being a woman and getting...irked with James at times. My DVD is part of the Ultimate James Bond Collection. There are several interesting extras, though I did think a few of them were a bit long. Overall I really like Goldeneye and Pierce Brosnan as James. I did get a longer review posted on Epinions. I hadn't realized it had been this long since I last posted about one of the Bond movies. Sorry about that. Pierce Brosnan returns as the fearless, cunning and devastatingly cool Secret Agent 007 in this thrilling adventure! When a ruthless media tycoon (Jonathan Pryce) tries to destabilise the world economy by orchestrating a deadly standoff between world superpowers in an attempt to achieve high ratings for his media conglomerate, Bond must step in to prevent World War III! Co-starring the gorgeous Teri Hatcher and Michelle Yeoh, this high-tech action-adventure will exhilarate Bond fans of all ages! I first saw this movie in the theater when it first came out. It is entertaining even though a few things about the plot are a bit far fetched. The idea of someone in the media manipulating stories seems believable, though Carver goes to extremes with his efforts, trying to start a war. That, along with some of the action scenes, are what is a bit far fetched in my opinion. The action scenes are done well and help to make things more entertaining. There isn’t much mystery to what is going on since Carver shares really early what his ultimate goal is. Some of what happens is a bit predictable, but that doesn’t make the movie less entertaining for me. The cast does really well with their parts. Wai Lin, the Chinese spy, works very well and is a good compliment to Bond. She can hold her own with him in many regards without falling into bed with him. My version of the movie has a lot of extras. Some of them did seem to drag on a bit long. I’ve been watching these extras on all the Bond movies, and some of them are very similar from movie to movie. I think even some footage that was used for previous extras was used again. Overall I really enjoyed the movie. I did get a longer review posted on Epinions recently.